SAN ANTONIO (AP) Two nights after playing with a full roster for the first time all season, San Antonio had to adjust yet again. It’s not what they want, but the Spurs are used to it. Pau Gasol added 17 points, 11 rebounds and seven assists as San Antonio’s big men keyed the team’s ball movement. The Spurs had 28 assists and just nine turnovers in improving to 17-2 at home and winning their third straight overall. The team effort helped San Antonio overcome playing without Kawhi Leonard and losing Rudy Gay to a foot injury after having a full roster Tuesday night. Leonard sat out for rest. Gay exited the game late in the third quarter with a sore right heel. There was no update on Gay’s status. Gasol had 10 points, 10 rebounds and five assists for the fourth straight game. Only reigning MVP Russell Westbrook of Oklahoma City has had a longer streak (five) this season. 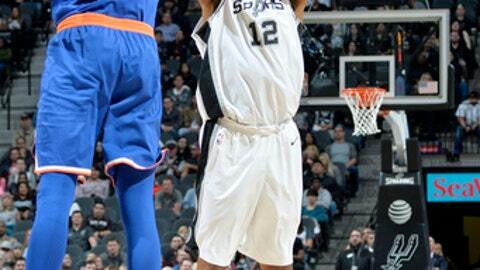 Tony Parker scored 14 points, including 10 in the first quarter as San Antonio bolted to an early lead. The Spurs led by as many as 17 points in an uncharacteristically high-scoring game for them. San Antonio was limiting opponents to 98 points per game, but New York was able to increase the pace. Reserve forward Michael Beasley led New York with 23 points. Courtney Lee and Porzingis had 18 points apiece, but Porzingis fouled out late in the fourth. Danny Green was 5 for 8, all on 3-pointers, in adding 15 points for the Spurs. ”They were able to, with the 3-pointers and the way they play, they were able to pick us apart a little bit,” Porzingis said. Knicks: G Tim Hardaway Jr. missed his 14th straight game with a stress injury to his lower left leg. … The Knicks are 5-9 in back-to-back games this season after losing both games for the third time. Chicago defeated New York 92-87 on Wednesday night. … Porzingis was averaging 7.0 points in the fourth quarter, third in the league. He had two points in the fourth against the Spurs before fouling out with 2:30 remaining. … Knicks are 2-12 on the road this season, having won Oct. 29 at Cleveland and Dec. 14 at Brooklyn. Spurs: Leonard was a late scratch from the lineup as his playing time remains limited following his return from a quad injury. It was the fourth time Leonard has sat out for what the Spurs listed as ”return from injury management.” … Parker has scored in double figures in 930 career games. Among point guards, only Gary Payton (1,035) and John Stockton (1,061) have more games scoring at least 10 points in league history. … Green is the 127th player in league history with 900 3-pointers. Kyle Anderson had 16 points and eight rebounds starting in place of Leonard. Popovich said the fourth-year player’s game is reminiscent of former Spurs reserve Boris Diaw. New York rookie Frank Ntilikina had a season-high 11 assists. Accomplishing the feat in front of Parker, his childhood hero, was especially meaningful for 19-year-old from France. Knicks: Visit New Orleans on Saturday night. Spurs: Visit Detroit on Saturday night.